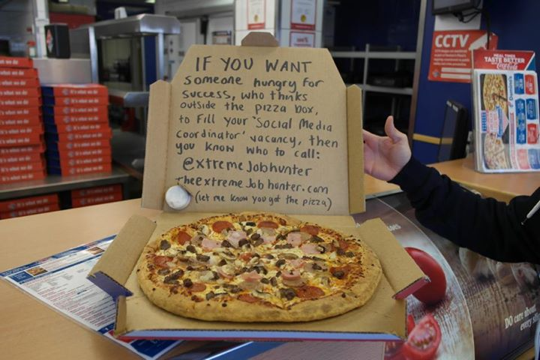 What do Gravy Wrestling, Pizza Box Lids and Batman have to do with Job Hunting? So, you think you’ve tried everything to market yourself and land a job? I bet U.K.-based Dan Conway, the self-branded “Extreme Job Hunter,” has done more. Conway, a 28-year old advertising professional, husband and father of two young children, has not been successful finding work. But, it’s not for lack of trying. Since being laid off in June 2012, Conway has concocted any number of attention-getting, oddball tactics, drawing from his social media skills and advertising background to push the envelope in the hopes of finding work. His job hunting efforts range from the traditional to the wacky, and include dressing up as Batman® to sending a pizza to a prospective employer with his hand-written cover note scribbled on the inside lid of the delivery box. Denied an interview for a social media job at a local university, Conway tried again, this time applying for work in a way guaranteed to get him noticed. – Resorting to outright bribery, from delivering a box of Krispy Kreme® donuts to one would-be employer, to sending Monopoly® money to another, and offering an iPad® to anyone helping him to find work. 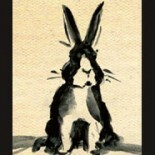 His comical tactics have resulted in the occasional interview. Even second interviews. But no job offers yet. Seems to me that had he been in the U.S., he would have been offered a TV reality show by now, focused on the difficulty of the job hunt and his crazy schemes to be hired. To watch the videos, read his hilarious cover notes to prospective employers, or possibly to offer The Extreme Job Hunter a job, see www.TheExtremeJobHunter.com. Thanks to Dan Conway for permission to tell his story and repost his images. Being a creative services professional also seeking employment, I feel his pain and wish him much luck. Thanks also to the Patch.com for reposting Erik Sherman’s AOL Jobs article, Meet ‘The Extreme Job Hunter’ – where I first read about Conway’s extreme job-hunting antics. Batman is a registered trademark of DC COMICS E.C. Publications, Inc. eBay is a registered trademark of eBay Inc. Facebook is registered trademark of Facebook, Inc. Google and AdWords are registered trademarks of Google, Inc. iPad is a registered trademark of Apple, Inc. Krispy Kreme is a registered trademark of Krispy Kreme Doughnut Corporation; Rohm and Haas Company. Monopoly is a registered trademark of Hasbro, Inc. Hear what Dan had to say himself, in a lively debate that erupted on Kathy Bernard’s Getajobtips LinkedIn discussion board: https://www.linkedin.com/groups/What-do-Gravy-Wrestling-Pizza-2943059%2ES%2E277513636?qid=f9e289c3-be46-4fee-8d32-f75a33721600&trk=groups_items_see_more-0-b-cmr. Incidentally, Kathy Bernard of http://www.getajobtips.com is one of my all-time fav career coaches, with excellent advice and tons of great tips on using LinkedIn to land that next job. This entry was posted on September 30, 2013 by Suzy Kedzierski in Business, Job & Career Advice and tagged career advice, employment, get hired, job hunting.